‘Leading Change’ workshop. For leaders and leadership teams. Leading change is a business-critical skill and an essential requirement of every successful leader and leadership team. This workshop enables leaders to understand the changes affecting their organisation, to fully understand why 88% of change initiatives fail and how to embrace change, engage with their people and enable them to deliver successful and sustainable change – together. Download the Leading Change Workshop Overview here. ‘Mission Impossible: leading change in successful organisations. Leading change is especially tough for market leaders. Complacency is the disease that only infects the successful. For long term, sustainable success, your leaders will need the ability to question the status quo, build an innovation culture and banish complacency forever. Download the ‘Mission Impossible: leading change in successful organisations’ Overview here. ‘Power to Change’ workshop for all employees. All change is personal. Change is difficult; even when it is good change. ‘The Power to Change’ workshop helps individuals overcome their natural change barriers and become ready, willing and able to deliver the change your business requires. It is a critical component of any successful change initiative. Download the Power to Change Workshop Overview here. Download the Change Catalyst Products and Services Overview by clicking CSI Change Catalyst Services Overview. Change Catalyst CEO Advisory Package: A tailored package of services to advise the CEO and ensure the organisation possesses the clarity of strategy, capabilities and skills to lead change, embrace change and deliver the strategy. Change Readiness Review: Helping leaders to understand their organisation’s actual culture through focused interaction with employees, partners, customers and relevant third parties. Successful transformation is impossible without a change-ready culture. A Change Readiness Review provides the baseline to enable future success. Download the Change Readiness Review Overview here. 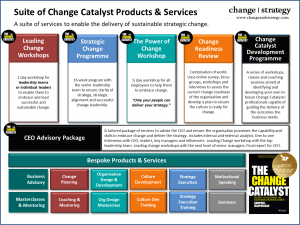 Strategic Change Programme. A 16 week programme for CEOs and leadership teams to ensure clarity of strategy, genuine alignment and successful change leadership. Download the ‘Strategic Change Programme’ Overview here. 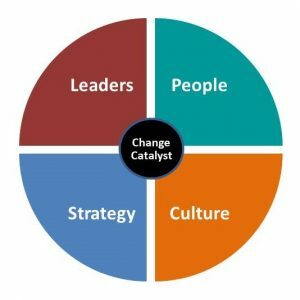 Change Catalyst Development Programme: Helping leaders to understand the role of Change Catalyst – capabilities, skills and key success factors. Helping to identify and develop in-house Change Catalysts and mentor the Exec Team to ensure the successful delivery of the outcomes the business needs. Download the Change Catalyst Products and Services Overview by clicking Change Catalyst Products & Services Overview.